I’ve been thinking for a long time about how I would write about my mother-in-law, Rita. My husband, our family, and I have known for over a year that her time on this earth was coming to an end, and during that time I have gone over in my mind how much my brief interaction with her has influenced my life. I know that Rita has been a wonderful mother for her two sons, and I would not be able to relate all that she has meant to them. So I will simply reflect on what she has meant to me, and some of the great memories I have of her. I first met Rita on Valentine’s Day 2011. John and I had been dating a month, and he told me he wanted to take me on a daylong date for V-day. I was admittedly a skeptic about this day, having never had a particularly romantic experience for it, but of course I said yes to Mr. Irresistible. I knew this guy was different when he said the first thing he wanted to do was take me out to breakfast to meet his mother. We had talked about her and I was curious to meet this warm, kind Hungarian woman, as John had described her, so I eagerly looked forward to this date. I was a little nervous, meeting his mom, but as soon as I saw Rita I knew there was nothing to be nervous about. She embraced me in a hug and greeted me with a gorgeous, red-lipsticked smile and a “Hi Honey!” in her deep, full-throated voice. We went into breakfast and Rita told me stories about her experiences as a waitress for many years, in Las Vegas and Phoenix. She was such a mom, insisting that John eat some of her omelette even though it had cheese in it (this would happen many times in the future to the lactose-intolerant John), and chasing the waitress down at the end to give her her tip in person, because she didn’t want anyone to steal it. By the end of breakfast I felt so comfortable with Rita, and could see where her son had gotten his kind, friendly nature and strong values. As time went on, I was able to spend time with Rita both with John and on our own. I often took her grocery shopping at Safeway, her neighborhood Arcadia store (still the friendliest store in town). It would take us nearly two hours to buy about 20 items, because Rita was very selective of her products (like mom like son), and because she would stop and chat with everyone along the aisles, especially young people and those with babies and small children. Her eyes would light up when she saw a little one sitting in the cart, and as soon as she flashed her bright smile at them, they would smile back, even if they were crying crocodile tears. Rita had such a way with people, she would call everyone “honey” and get them to smile and open up about their day, or their favorite frozen dinner, or whatever topic was handy. She had a gift for gab, my husband says, and he was right, she was naturally gifted at talking to people and putting them at ease. One of the most important things I keep with me from my time with Rita was understanding that being friendly to people is the best way to go around in the world, because at heart, everyone just wants to see a friendly face and a smile – even at the grocery store. Maybe especially at the grocery store. Rita grew up in very poor circumstances, one of eight children in Michigan. She told me that she hated corn because as a child the corn farmer near their house had given her mother bushels and bushels of corn to help the kids have something to eat, and she had eaten enough corn to last a lifetime. She had never eaten much meat, let alone red meat, and the first time her husband-to-be took her out for a date to a steak restaurant, she got sick. After marrying and moving out west, Rita’s husband Giuseppe asked her to waitress for his restaurant, and a star was born. She took to it like a duck to water, and waitressed for many years in Las Vegas and Phoenix. I can imagine she was the best kind of server: hardworking, patient, friendly and funny. She used to tell me how the other girls at the Las Vegas Hilton were jealous of her, and who wouldn’t be, I’ve seen pictures and she was a knockout – skinny, red hair piled on her head, and with those beautiful red lips and a big smile on her face. Rita used to tell me that when diners would bring their children in to eat, and the kids were whimpering or wanted another chocolate milk, she told them she wouldn’t get it until they ate more of their food. Once or twice she even picked up a forkful and put it in their mouths, to which the toddler would respond with wide eyes, but they would eat it and the parents would thank her! She was always a no-nonsense person, and people naturally respected her. I also enjoyed seeing Rita with her three living sisters, Carolyn, Elaine and Mary Ann. I have three sisters myself, and watching her interact with them made me think of the day when all of us McWilliams girls would be hobbling around one another’s houses, talking about our grandkids and the economy. Rita was the glue that held them together, bringing food, a quick smile, and a listening ear to her sisters’ stories. It was so sweet to see how close they were after all those years, and I know they miss her very much. Rita fought a long battle with chronic leukemia, a blood disease that causes the blood to produce too many white blood cells. She successfully beat the odds and stayed in relatively good health for many years, but the autumn before John’s and my wedding her health began to decline and she was in and out of the hospital a few times. John and I were blessed to have her walk down the aisle at our wedding, however, and to see us start our new life together and celebrate with family. After the wedding, we were talking one day about how she was feeling, and I tried to reassure her that she would live to see more grandchildren, but she said simply, “I was lucky to make it to your wedding, that is what I wanted. We can’t ask for more.” A little while after that, she succumbed to illness and had to go into assisted care. Rita’s twin brother, Richard, passed away earlier this year, and I think at that point we knew Rita was going to leave us soon too. It was so hard to see this lady, once so bubbly and energetic, lying in bed, unable to walk or to speak with us, but we could see the love in her eyes and said our goodbyes to her and I think she heard us and understood. Even though I only had two years with her, Rita was the best mother-in-law I could have asked for, and from the beginning she championed our relationship and was a role model for a patient, caring person. She would call us nonstop several times a day, sometimes driving John nuts, but now he and I miss her calls and I still have her picture on my speed dial. Her faith in God and deep religious conviction were inspiring to us as a couple, but she never lectured us or judged, she simply showed us how a truly good Christian couple should embrace everybody with compassion and love. Her life really is a legacy, and though we won’t get that last wish to have her hold our future child in her arms, we will never let that child forget how much their grandmother meant to us, and what a cool lady she was. John told me that his mom once said if she could be any animal, it would be a bird that could fly freely. 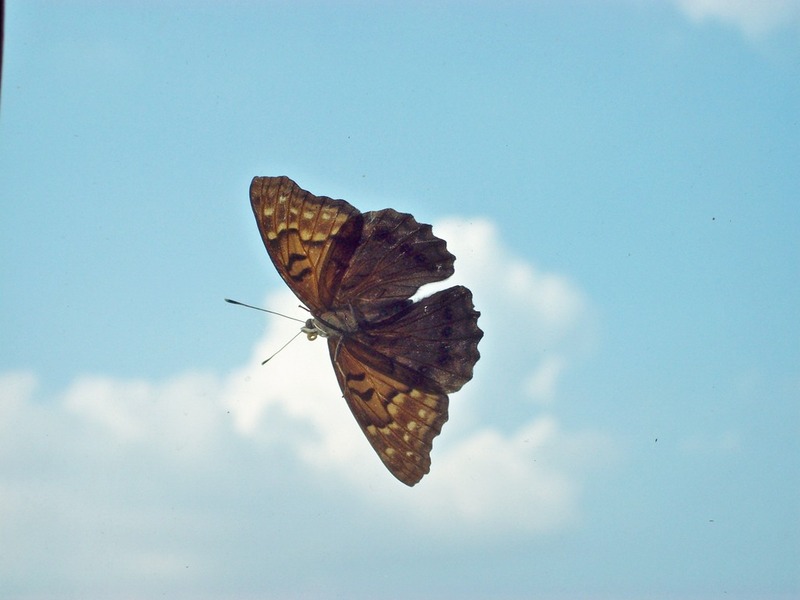 The day she passed away, for the first time all year I saw a beautiful butterfly float through the blue sky in our back yard in the sunshine. Without hesitating, I said, “Goodbye Rita.” I know your spirit flies free. A. Phigg on Hello world!